Noow is a new media player with some not-so-convential addons and additional utilities which are sure to make your video experience a little easier and certainly quicker every day. Noow is optimized for playback of high definition media files such as MKVs, Hi-Def DivX and XviD and downloaded files from media sharing web sites. 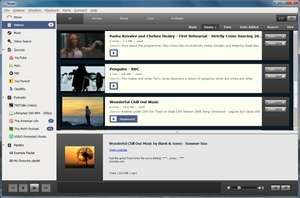 This fully-featured media player also integrates web features within the interface and allows you to basically sync your PC with popular video web sites like Yahoo!. It gives you access to the high-definition or standard-definition versions of videos with the built-in search function. Version 2.0b is a freeware program which does not have restrictions and it's free so it doesn't cost anything. For security reasons, you should also check out the Noow Media Player download at LO4D.com which includes virus and malware tests. Additional screenshots of this application download may be available, too. Noow Media Player has a presence on social networks.